In its first few weeks, the Trump administration has brought a number of issues to the fore of American consciousness – justice, environment, health, rural economies – all of which can be united by a single variable: food. For Americans looking to affect change in an erratic political landscape, the food system is a good place to start. It's also a system in need of change. American diets are the most resource-intensive on the planet, more than two-thirds of the country's adults are overweight or obese, and a comprehensive new Farm Bill could be negotiated as early as this year. 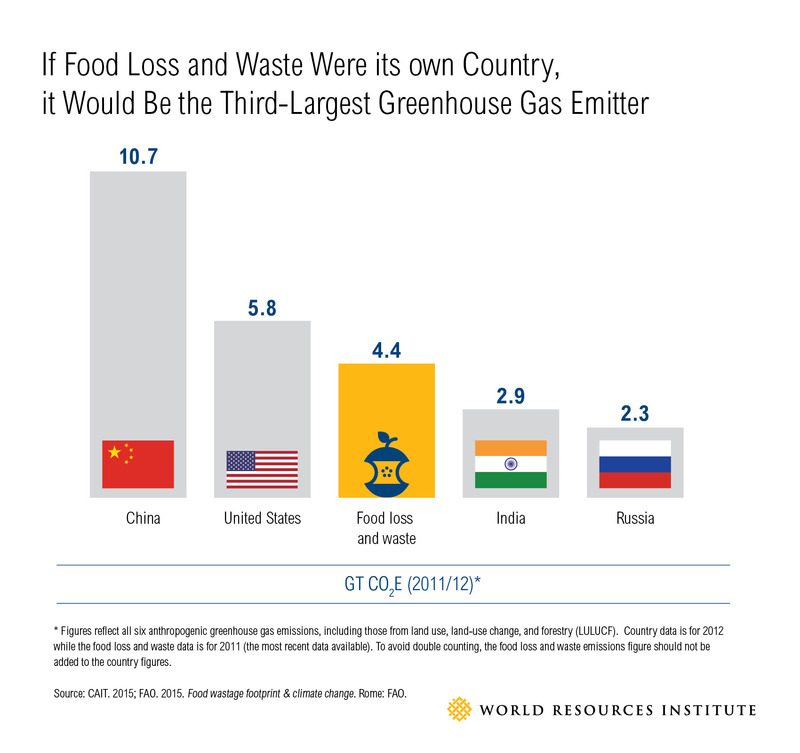 In the United States, 40 percent of food is wasted, and every year American consumers, businesses and farms spend $218 billion growing, processing, transporting and disposing food that is never eaten. The United States comes in dead last among developed nations in the Economist Intelligence Unit's new food sustainability index, which ranks how much food countries waste. Food labels present an opportunity for consumers to make a change. "Sell-by dates can be totally arbitrary and inaccurate," said D.C. Councilwoman Mary Cheh, explaining how sell-by dates in Washington too often prevent perfectly good food from being eaten or donated to communities in need. If consumers paid attention to when perishable foods are safe to eat, rather than treating "sell-by" or "best-by" dates like expiration dates, less food would go to waste. Food companies, too, can help cut back on food waste by improving their labelling practices and responding to consumer demands. "Our products are changing just because of what the consumer wants right now…if it's food the consumer wants, that's food that won't be wasted," said Ted Monk, VP of sustainability and corporate responsibility at Sodexo North America. Monk highlighted Sodexo's commitment to zero food waste in landfills as part of the United States' overall goal of halving food waste by 2030. Organic and local food products represent the fastest-growing segment in the U.S. food industry. In a panel on the upcoming Farm Bill, which will reshuffle funding and programs concerning everything from crop insurance to rural development, Kathleen Merrigan, former deputy secretary at the U.S. Department of Agriculture, said that advocates attempting to make cuts to organic provisions in the bill are "cruising for a bruising." Consumers, Merrigan said, are sending a clear message that they care about who is producing their food, and that they want to know where it's coming from and how it's made. Organic and other low-impact methods of farming are now more essential than ever, given that "we currently have the thinnest and most depleted soil in the history of agriculture," said Jerry Glover, a soil scientist and advisor at USAID. Buying products that are produced sustainably and locally eases pressure on natural resources, and supports local farmers and communities. Deciding whether to buy products that are local, organic and fresh is a meaningful way for consumers to exercise their power within the food system. Still, the most simple (and affordable) way to make a difference is to eat less meat – especially beef. 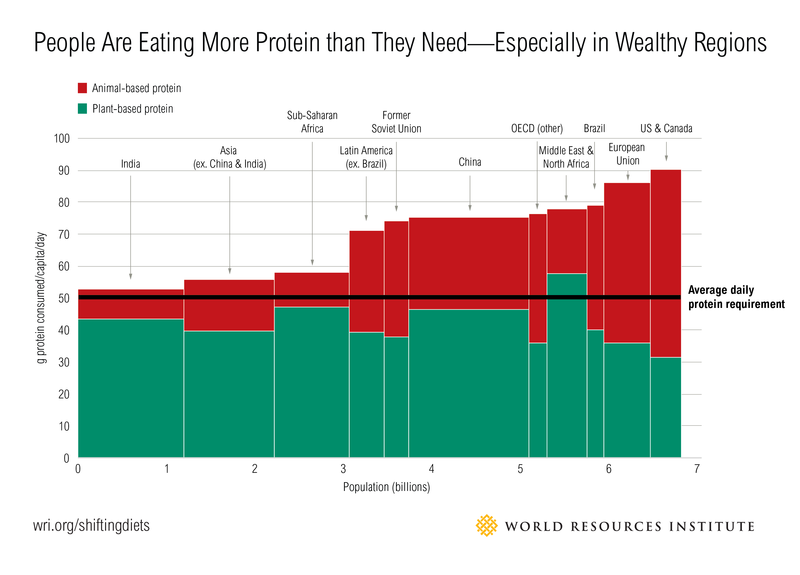 "Ninety percent of the footprint of the American diet is because of animal-based protein," said Janet Ranganathan, VP of science and research at WRI. 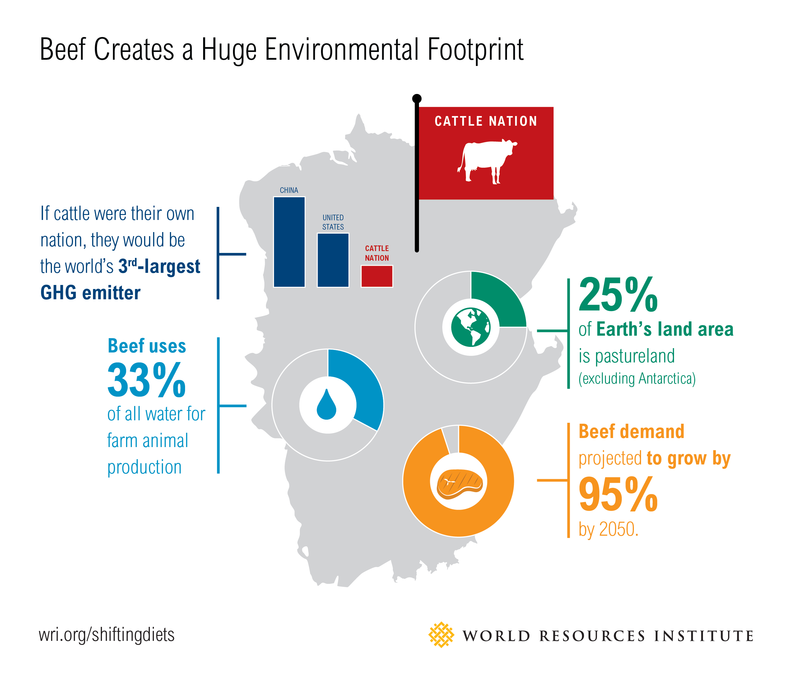 Janet explained that Americans' love for beef is contributing to the depletion of land around the world, and makes up a significant share of global greenhouse gas emissions. Americans are already consuming more protein than they need, and in many cases people are getting enough protein from plants without even realizing it. 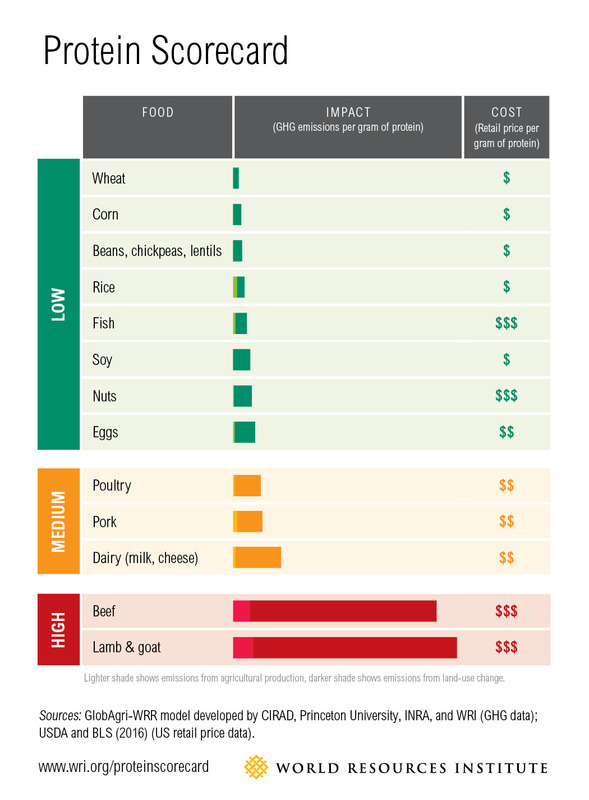 Cutting back on beef and substituting plant-based sources of protein would allow Americans to cut their dietary environmental footprint in half (check out WRI's protein scorecard for more information). According to Monk, Sodexo has recently seen consumer demand for plant-based options grow by 10 percent. Food companies are responding by offering plant-protein innovations like the meat-free Impossible Burger, and adapting their business models to invest in meat alternatives, as Tyson Foods has. 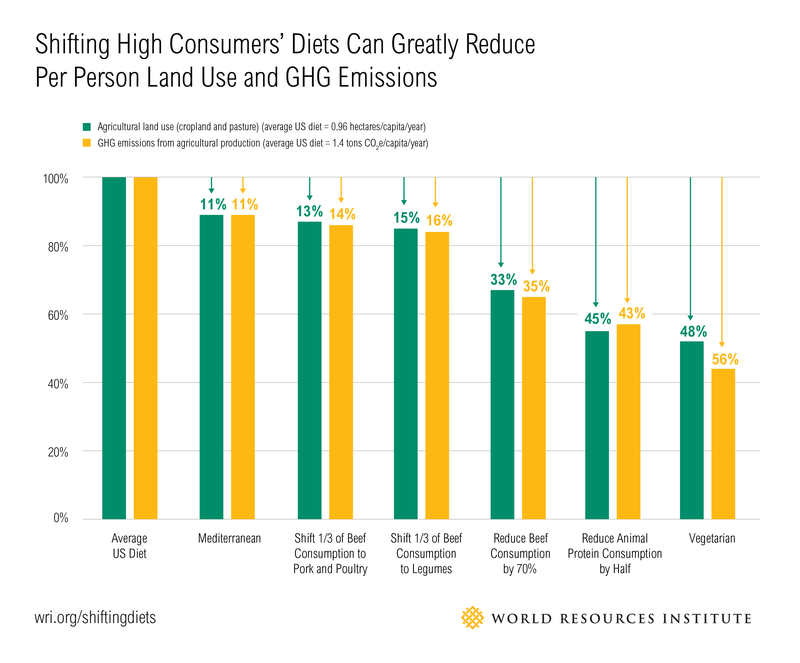 Consumers choosing to cut back on meat can accelerate this trend, and in doing so, help conserve resources and stabilize a warming planet. In today's America, food choices are an avenue for change that can transcend political divisions. However, consumers cannot fix the food system on their own. Farmers, policymakers and businesses across the supply chain need to engage in order for transformative change to happen. In particular, an important area to watch will be how businesses can help consumers make better food choices. "A lot of food decisions are driven by our marketers," said Emily Buck, a farmer and professor at Ohio State University. WRI's shift wheel and the Better Buying Lab can help companies harness the powers of marketing to build a better food system. In a country where 75 percent of consumers say sustainability factors into their food choices, American businesses should enable people to buy and eat more sustainable foods.